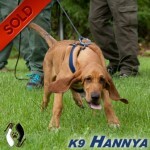 Hannya is a 15 week old pistol of a hound and will be a handful of trailing potential for any agency looking for a manhunter. This girl is really something to watch already. She is currently at the GAK9.com Edisto facility for training and is available for sale to the appropriate handler or agency.